Will Noble Gog And Magog: Who Are They And What Have They Got To Do With London? Holmes and Watson, Gilbert and George, Reggie and Ronnie: London has spawned its fair share of famous duos before now. But how much do you know about London's original duo, Gog and Magog? Good question. Their names first appear in the Old Testament's Book of Ezekiel, in which Gog is a landowner and Magog is the name of the land. Later on, in Revelation, they become one entity — a representation of the hostile nations of the world (in 1971 US president Ronald Reagan claimed "Gog must be Russia"). From hereon in, things get chaotic, "bewildering", even, as Brewer's Dictionary of London Phrase & Fable puts it; Gog and Magog crop up in all manner of folklore from all number of countries, religions and eras — as people, giants, countries, armies and various other entities. At one time or another, everyone wanted a piece of — or was at least scared witless by — Gog and Magog. So what have they got to do with London? One of the legends of Gog and Magog explicitly concerns London. As with most legends, there are variations on the theme, but a popular one goes that Gog and Magog (or confusingly Magog and Cornelius) were two monstrous giants, the product of the 33 wicked daughters of Roman emperor Diocletian and certain demons they'd been canoodling with. As he founded New Troy (which would become London), the heroic Brutus tamed the two colossi, forcing them to serve as guardians of the city by chaining them outside his palace, the site of which is now Guildhall. Of course, the tale is nonsense, but somehow the legend lived on, and the duo continued to be associated as the city's guardians. The effigies of 'Gogmagot the Albion' and 'Corineus the Britain' were recorded as appearing at the coronation of Elizabeth I in 1558 (where exactly, it isn't clear), while the giants were already making appearances at the Lord Mayor's Show by 1554. While originals, made from papier mache, went up in smoke during the Great Fire of London, the replacements were gnawed away by mice. Where can I see Gog and Magog now? From 1839 until the late 1920s, you could see Gog and Magog figures on the front of the grand Bennett's Clock Shop on Cheapside. After that, they went on permanent vacation to the Henry Ford Museum in Michigan, where they now appear as part of a glorified candy store (the same museum has the limo JFK was assassinated in — it sounds like quite a place). Today your best bet in London is in Guildhall's Great Hall; Brewer's claims there have been statues of Gog and Magog here at least since the 15th century. The originals, made from papier mache, went up in smoke during the Great Fire of London, and though, in 1672 Lord Mayor's Pageantmaster Thomas Jordan hoped the replacement figures "never to be demolished by such dismal violence as happened to their predecessors,” they were gnawed away by mice within years. Sturdier oak replacements were carved by Richard Saunders and installed in 1708, but destroyed in the Blitz. Today's Gog and Magog — these ones crafted from lime wood — were fitted by sculptor David Elms in 1953, and loom nine feet tall. Here's a video of Elms making his finishing touches. Bur these aren't the only Gog and Magog in Guildhall's possession. Just outside the Great Hall, on display behind a glass panel, reside a wicker Gog and Magog. 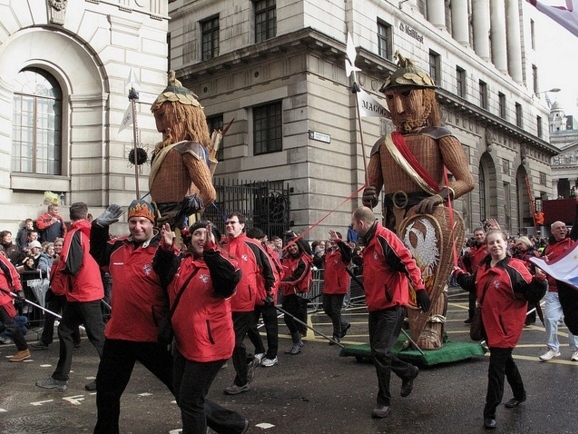 Just like the statues in Guildhall, there have been various incarnations of these wicker men — the ones here now were donated by the Worshipful Company of Basketmakers in 2007, and have been paraded in every Lord Mayor's Show since (see main image). It's a strangely pagan spectacle to behold, especially in the middle of London. But these two mighty symbols of London have earned their status, if through sheer tenacity. Revealed: Who Is Inspector Sands?